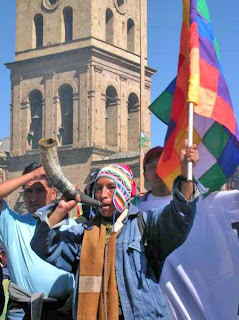 Latin America Herald Tribune, La Paz – A group of Bolivian peasants in the southeastern province of Potosi occupied and set fire to offices of the San Cristobal mining firm, a unit of Japan’s Sumitomo, near the border with Chile. Friday’s protest was staged over the alleged failure by the Potosi government to live up to some promises it had made to the peasants, the state-run ABI news agency and Erbol radio reported. San Cristobal said in a statement that the blaze did not cause any injuries but that the peasants had overturned containers filled with mineral ore being taken for export to foreign markets via Chile, adding that the protesters’ actions represented “big losses” for the firm. The mining company said it hopes a solution to the conflict will be found in the near future. The protesters are demanding an electricity project, a tax on the water supplied to San Cristobal and the installation of communication antennas. They also want the headquarters of the state-owned EBRE evaporitic resources company to be located in the Uyuni Salt Flats, also in Potosi, as opposed to La Paz. The conflict in the region flared up at the beginning of the week, when the peasants blocked roads and the rail line for export to Chile, demanding to speak with outgoing Potosi Gov. Mario Virreira.The demonstrators said they want to present a list of demands to Bolivian President Evo Morales. San Cristobal operates a huge mine producing silver, lead and zinc near Bolivia’s border with Chile. The main issue of the San Cristoban mine is water: the mine uses massive quantities of water, taken from aquafers of ancient water that is not relaced by the very low rate of rainfall. Springs and wells that local people use for everyday livng and for watering crops and cattle are drying up, and a recent report from a world expert in water issues and mines says that this will continue, with more and more farming communities experiencing complete drying up of water resources and deteriation of quality of water (contamination from mining processes) in the 20 years of the mining contract. Pay-offs to communities will not substitute for the lack of water that is necesary for human existence.